Heytesbury shire (1895-1994) was an area in western Victoria south of Cobden and Terang. A large part of it was once the Heytesbury Forest between Cobden and the Otway Ranges. The shire was named after the County of Heytesbury, which was probably named after the first Baron of Heytesbury, William A’Court (1779-1860) of Wiltshire. Until the shire was proclaimed on 31 May 1895, its area was administered by the northerly Hampden shire, headquartered in Camperdown. The chief areas of early settlement were on the edge of the northern lava plain, Cobden and Timboon on the Curdies River and Port Campbell on the coast. In 1892 the Curdies River area was opened by a railway from Camperdown to Timboon, facilitating market access for timber and dairy produce. During 1928-33 some of the Heytesbury Forest east of Timboon was cleared for additional dairy farms. During the 1950s the clearing of much of the Heytesbury Forest was undertaken, faster and more effectively with heavy mechanised equipment. The clearance was almost entire, leaving only 25 of 450 sq km undisturbed. Nearly all of the cleared land was used for dairy farms. The Rural Finance and Settlement Commission established the township of Simpson near the middle of the Heytesbury settlement area. In 1989 the last parcel of farm land was sold. 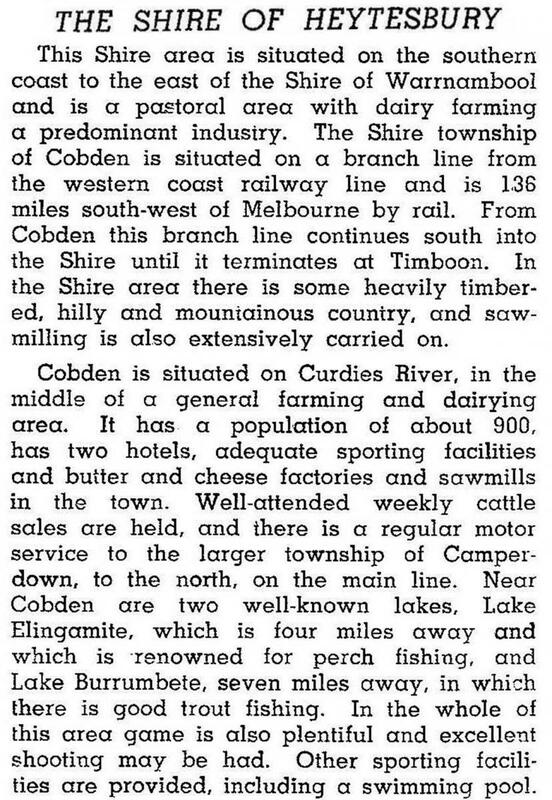 The concentration of dairying in the Heytesbury shire moved the centre of the dairy processing industry from the Colac area to Cobden-Timboon-Simpson. Each of the latter had dairy factories. The coastal strip contains the Port Campbell National Park, including the Great Ocean Road and the off-shore scenic stacks of tertiary rock known as the Twelve Apostles. Port Campbell generates considerable income from recreational diving and tourism. In 1994 farming occupied 80% of the shire’s 1558 sq km. There were 138,860 dairy cattle, 37,450 meat cattle and 62,840 sheep and lambs. On 23 September 1994, most of Heytesbury shire was united with most of Hampden shire, past of Otway shire, small parts of Mortlake and Warrnambool shires and Camperdown town to form Corangamite shire.